It's almost here!!!! College football starts next week! Notre Dame (in case you haven't guessed that already ;). 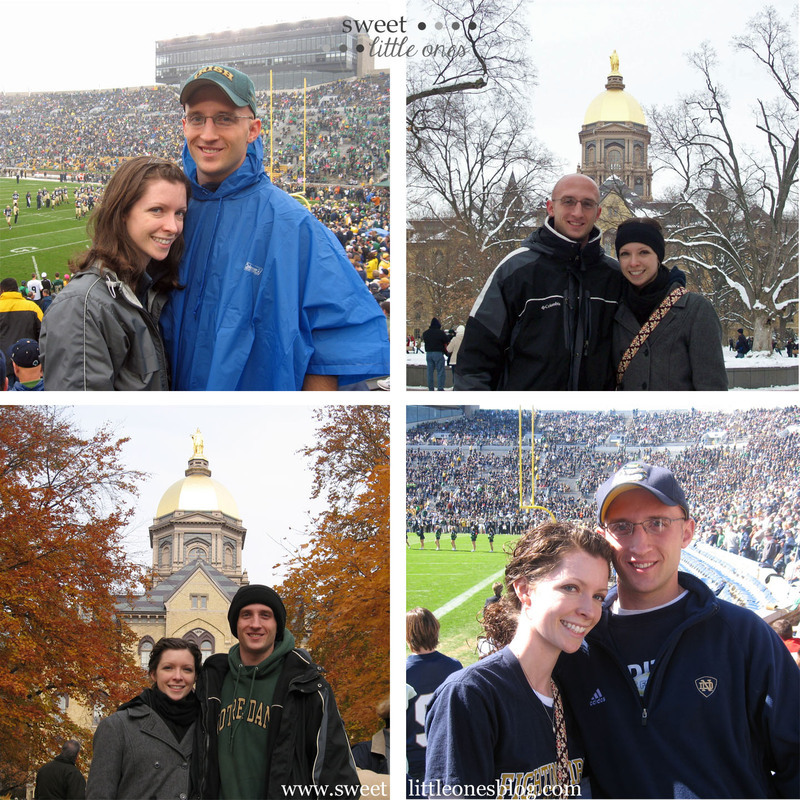 I have always loved and watched Notre Dame football, but never really focused on specifics til I was married (and had a husband who did ;) So my favorite players are more current ones: Brady Quinn, Jeff Samardzija, Manti Te'o, and Jaylon Smith. My favorite analysts are Cris Carter, Cris Collinsworth, and Mike Golic. And I'm throwing a coach in there too: Lou Holtz!!! 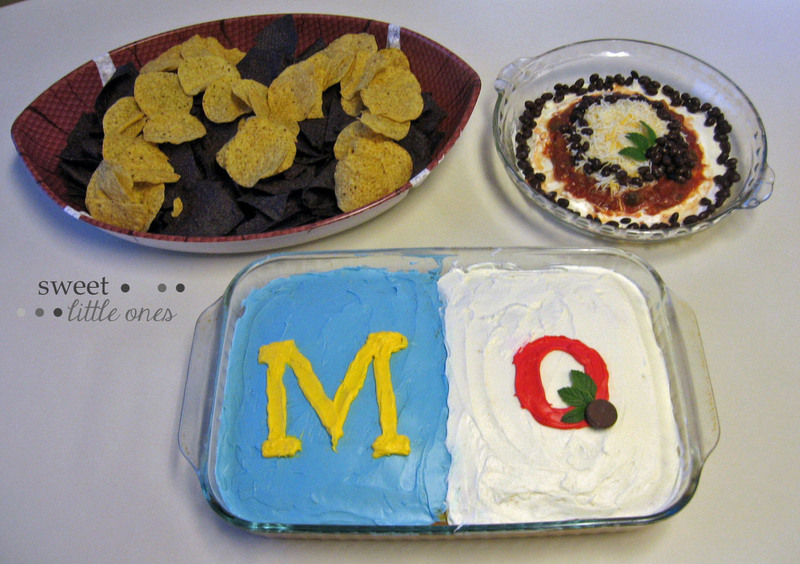 Michigan "M" maize and blue tortilla chips, Ohio State "O" and Buckeye taco dip (emphasis on dip ;), and Michigan/Ohio State cake. Am I an awesome employee or what? After them, I can't stand USC, Stanford, Purdue, and just about every SEC team. And instead of really despising players, I despise coaches and commentators. The two I dislike the most are Pete Carroll (former USC coach, current NFL Seahawks coach) and David Pollack (ESPN analyst). Jim and I started going to Notre Dame on game days back when we were dating, and now we get to share this tradition with our kids. We always get there early and spend the day enjoying all of our traditions: visiting the Basilica, the Grotto, and the Golden Dome, rubbing Knute's nose for luck, walking around the lakes, watching the Players' March and the Marching Band parade to the Stadium, going to the 11th floor of the Library (aka Touchdown Jesus) to enjoy a great view overlooking campus, watching the game on big screens at the athletic center with the other fans, and singing the Alma mater at the end of the game - win or lose. But my favorite tradition is a new one. Every year we've been on campus for game day, I've seen parents and kids playing football together in the grassy areas of the quads. Since we struggled with starting our family, I longed for the day when that would be us. Now, our daughter J is old enough to play catch (somewhat!) and our son B can a little too. It was such a special moment for us as a family the first time we got to do this. And now playing football on the quad will be a tradition that we do every time we're on campus! Every game day, we start off the day by blaring "Here Come the Irish" by Cathy Richardson 10+ times in a row to pump ourselves up. (I may or may not have listened to this on repeat while writing this post.) I guess you know it's a tradition when your 3 year old asks for it and can sing along! And during the game, Katie and I always text each other...usually ridiculous texts about the game, refs, players, opposing team...especially if the game isn't going well. Hey, sometimes laughing is the only way to get through a bad game. For the kids... Boys: jerseys and the old school leprechaun. Girls: cheerleader outfits and pigtails. 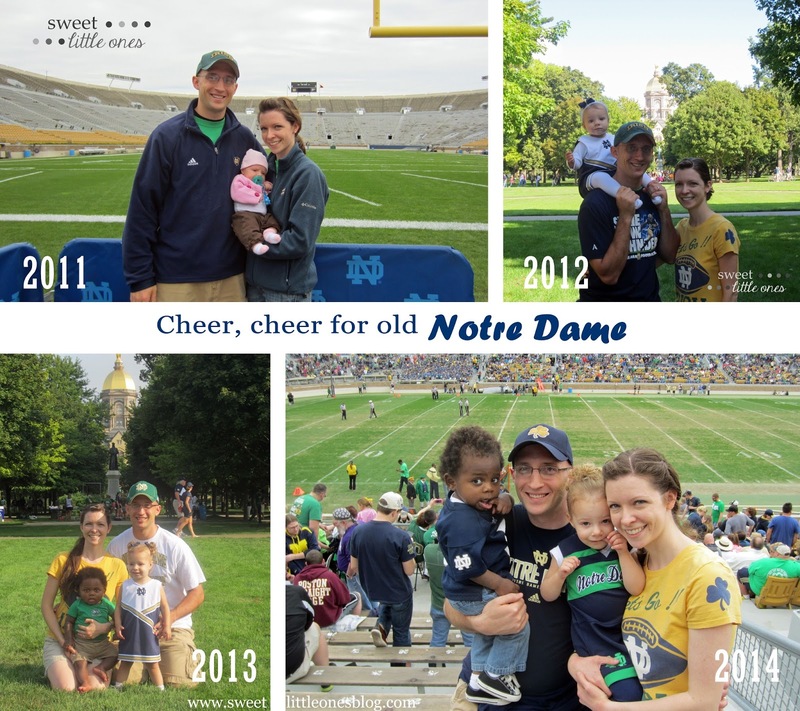 This is just a glimpse into our family's fanatical love for Notre Dame. So what teams do you love? Or hate? What are your favorite football traditions? Good luck to your favorite team this season, that is except for when they're playing Notre Dame...or if they're Ohio State. ;) Goooooooooo Irish! 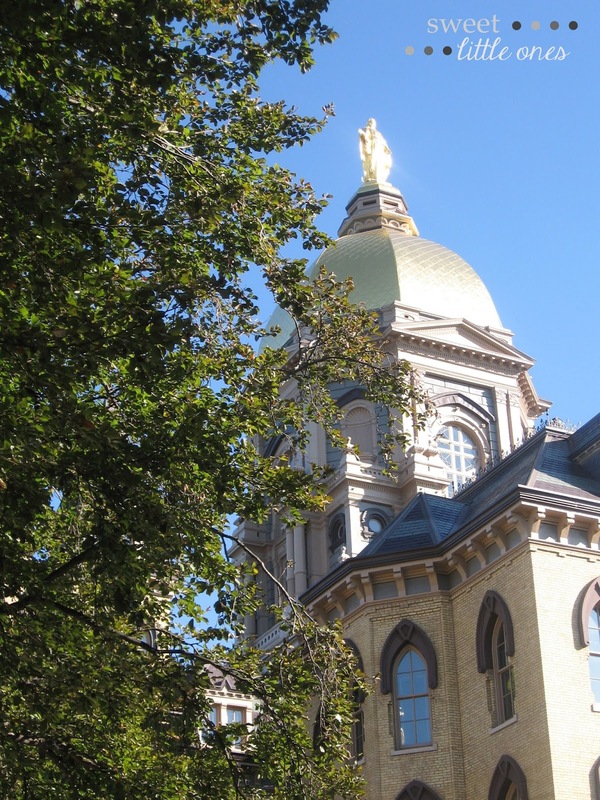 ...And our hearts forever, Love thee, Notre Dame! Sometimes I think that maybe if I had gone to the University of Minnesota instead of the college that I went to I'd be a bigger college football fan...and sometimes I wish I had/was. Instead I went to a school that was big into hockey, which don't get me wrong I love!, but had I gone to the U maybe I could've fallen in love with both. Living in Texas & not being associated with any college football team can be rough but trying to find one that I have no ties to at 26 seems a bit lame. I love college football!! I'm super excited for football season to start. We are Hurricanes fans here in Miami!!! We're ready!!! I love all your pictures!! You might hate Ohio State, but I am at least neutral toward ND! Hehe, I get way more into the NFL than college anyway since I work in the NFL world :) I do think it would be cool to see ND's campus/stadium one day... we just watched Rudy the other night hehe! Fun post!!! Love what you did with the Michigan/Ohio State food, that's awesome. I do love me some football food and LOVE the movie RUDY!!! What a fun post! Despite the fact that you hate my beloved Buckeyes ;) Here's to a fabulous football season! MIZZOU just joined the SEC last year and they didn't do so hot so I'm hoping that now they've been in it a year they can step up their game this year. Either way it will be fun to watch! Stopping by from the link-up! I am not a Notre Dame fan, but I am traveling to South Bend for work in September... hoping to get a chance to see the stadium and some of the campus! I always love seeing other schools' stadiums and such - makes seeing it on TV so much more fun later :) Have a great weekend! Yay for college football!!! The most wonderful time of the year :) We are big Michigan fans but I'm glad we can share in our hatred for Ohio State, ha! 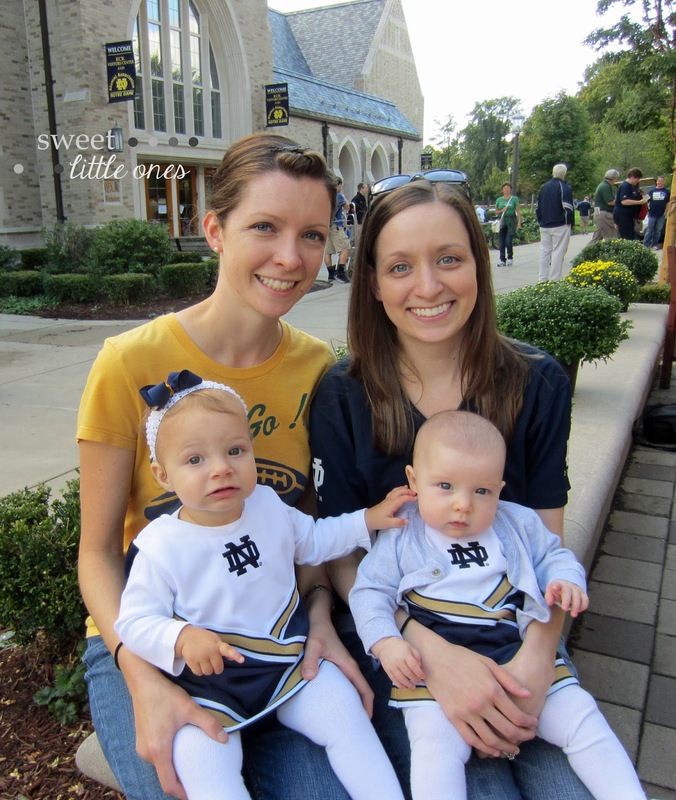 Loved hearing about your game day traditions with the kids.. so sweet! so fun! I am not into college football but I love the Broncos and the NFL! Just discovered your blog, and am really enjoying reading about your family. And seeing that you like the Broncos too, because of Peyton, makes me like you both even more! Side note: I'll be skipping the Super Bowl this year. Could it be two worse teams? 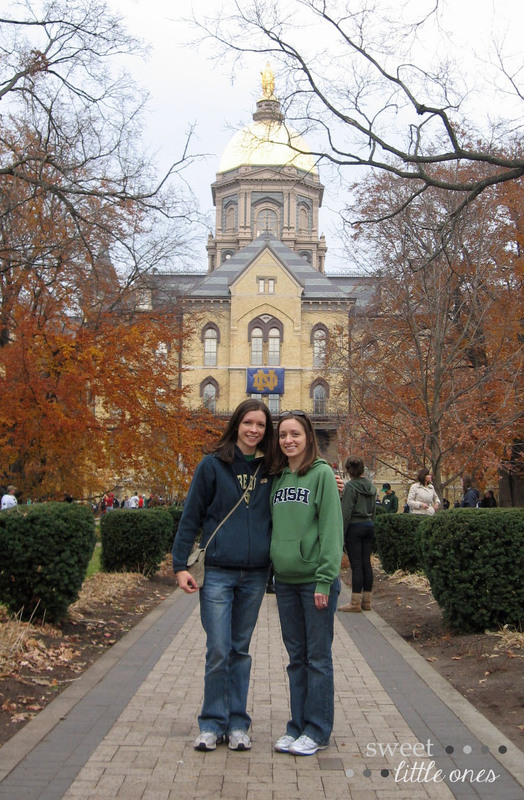 Jess did you go to Notre Dame? My brother did and 2 of my former roommates/friends went as well. My family loves ND too! Don't even talk to my brother if they lose! Haha! It is such a beautiful campus!